Are you a low-risk investor? That's tough with the market near all-time highs. Here are three stocks for you to take a look at now. Working on the future of communication. Image source: AT&T. The market is hovering around all time highs, which can make high-risk investments look safer than they really are. Don't get lulled into a false sense of security, there's a lot of risk out there and now might be a good time to look for safer options. Which is why ExxonMobil (NYSE:XOM), Enterprise Products Partners (NYSE:EPD), and AT&T (NYSE:T) are three great stocks for low-risk investors to take a look at right now. Exxon and Enterprise both hail from the oil and natural gas sector. This area has been reeling from the steep fall in oil prices that began in mid-2014. Although the price of oil has swung through a couple of sizable ups and downs recently, it's still well off the highs reached prior to the big drop. Natural gas, meanwhile, has been in a funk for even longer, which is why investors have been wary of anything even remotely related to oil and gas. And it's been tough. ExxonMobil is one of the world's largest integrated oil companies, meaning it does everything from pulling oil and natural gas from the ground to processing it and delivering it to end users. This oil giant has seen its top line take a huge hit. In the second quarter of 2014, revenues were roughly $111.5 billion -- in the just-ended second quarter, revenues were around $57.5 billion. Earnings were over $2 a share in the second quarter of 2014 and were just $0.41 in the second quarter this year. Clearly, Exxon is facing hard times. But it's actually holding up better than many of its peers. Fellow giant Chevron (NYSE:CVX) has been bleeding red ink for three straight quarters. And while Royal Dutch Shell (NYSE:RDS-B) is still in the black, both Chevron and Shell have put dividend hikes on hold for more than a year, while Exxon has kept on increasing its dividend -- extending its annual streak to 34 consecutive years with yet another dividend increase in the second quarter. There's a reason Exxon's stock has weathered this downturn better than most. Add in the fact that Exxon has historically bested its peers on return on invested capital and there's even more to like, here. 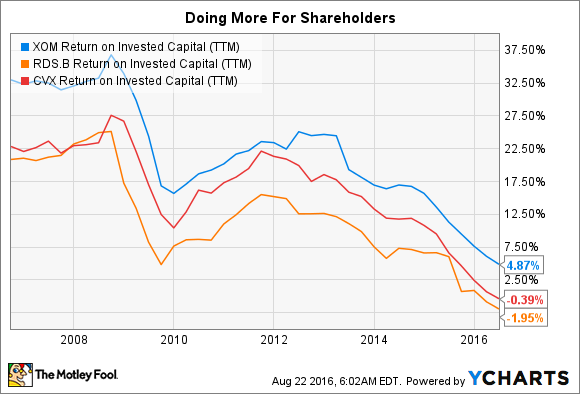 (That metric, shown in the graph above, examines how well a company puts its shareholders' money to work.) If you're looking for low-risk stocks, Exxon should be on your list. Enterprise, meanwhile, is more of a focused play, operating in what's known as the midstream business. Essentially, it helps get oil and gas from where it's drilled to where it's used. The company owns 49,000 miles of pipelines, 250 million barrels of oil storage, 14 billion cubic feet of natural gas storage, 25 gas processing plants, and 22 natural gas liquid and propylene fractionators, among other things. It's one of the industry's largest players. And here's the thing, most of its business is about moving products for a fee -- a toll-booth model. It doesn't care as much about the price of oil and gas, only that oil and gas is still moving through its vast network of pipes and other facilities. And that's why Enterprise hasn't really skipped a beat despite the oil industry downturn. For example, this limited partnership has continued to increase its distribution each and every quarter right through the downturn. The distribution has gone up for 18 consecutive years at this point. Moreover, its current payout is well within the means of its cash flows, with distribution coverage of 1.2 times in the second quarter. And it has roughly $6.6 billion worth of growth spending scheduled between now and the end of 2018, so there's plenty of reason to expect Enterprise to keep that distribution streak alive. Building the future at Enterprise. Image source: Enterprise Products Partners. If you're looking for a low-risk way to play the oil and gas space, Exxon is a good diversified option. Enterprise pulls out what might be the lowest-risk business in the industry because of the toll-taking nature of the midstream space and packages it up nicely for you in an income-focused limited partnership. That's definitely worth a deep dive for the risk-averse. Switching gears, another stock worth looking at for risk avoiders is AT&T. Many years ago now, this telephone giant started to refocus its business around cellphones, a move it made along with Verizon (NYSE:VZ). That provided years worth of growth for the pair. But the U.S. market is pretty much saturated, with a fierce battle for market share now the norm. Both companies are now looking to new directions. Verizon appears to be trying to build a content and advertising business with the acquisition of AOL and the pending purchase of much of Yahoo! 's business. There's nothing wrong with this decision, but it's taking Verizon off in a new direction. AT&T, meanwhile, has acquired cellphone companies neighboring Mexico and recently bought DirecTV. AT&T is doubling down on owning the pipes into people's lives, a business it knows well. Although the DirecTV purchase is still relatively new, the company reported that it has already added a million new customers since consummating the acquisition in late July of 2015. And in Mexico, AT&T is working to rebrand around its iconic name and upgrade its service offerings. Both should help lure new customers and cement relationships with current users. The telecom giant believes it can increase the number of Mexican customers on its LTE service by 15% in the second half of 2016. With 32 years of annual dividend hikes, conservative investors can take solace in AT&T's history of rewarding shareholders. But equally as impressive is that, despite the spending on its growth efforts, AT&T remains solidly profitable, with adjusted earnings of $0.72 a share in the second quarter, up slightly from the year earlier figure. And more to the point, that's easily enough to keep paying, and likely increasing, its $0.48 a share dividend. When all is said and done, Exxon, Enterprise, and AT&T are three great stocks for low-risk investors. And with dividend yields of around 3.4%, 6%, and 4.6%, respectively, they pay you pretty well to stick around, too. If you're risk-averse, this trio is worth looking at. You might find that one or all of them find their way into your portfolio.